Posted 6/8/2018 11:27am by Leslie Cooperband or Wes Jarrell. Goats, being crafty and curious creatures, are always on the lookout for the next best thing. The manner in which they “graze” a pasture is furtive and selective. They dart to and fro, grabbing mouthfuls of grass here, forage alfalfa there and tender thistle shoots when the mood strikes them. During their daily guided walks to the prairie and riparian zone, they are usually satiated by the smorgasbord of herbivory in their midst, heads buried or necks outstretched to grab some cottonwood or honey locust leaves. Occasionally, someone in the group spots something especially alluring in a distance field and moves quickly toward the object of her desire. If the rest of the group chances to look and up and witness the break away, they begin to follow in quick pursuit, the wave of goat heads akin to a school of fish averting a predator’s jaws. The lone goat herder has little chance to head them off and avoid decimating the neighbor’s growing corn field without the use of a ‘secret weapon’—the water gun. Goats, unlike their ruminant cousins, (cattle and sheep) hate to get wet. At the slightest hint of a few rain drops, they scurry towards the barn for shelter. Playing to their dislike of wetness, strategic squirts with the water gun have proven to be an effective (and incredibly fun) way to keep the goats where we want them. We used the herding by water gun technique this week as we moved our bucklings from the kid barn through the orchard into the summer pasture area. Our usual strategy for moving kids is to have a pied piper person in front of the pack shaking a bucket of grain. This works if they are hungry, but this group was moved in the morning, not too long after their feeding. So, the second herder brought up the rear with a water gun. The “carrot-stick” approach worked beautifully; they jogged down the mowed path with little deviation into the orchard. In a matter of minutes, they were flowing into their new home, bleating with simultaneous excitement and trepidation. They learned their “hot wire” lessons quickly and within an hour, they were settled into their new digs—some lounging under the shade of their shelter; others exploring hidden delicacies of their new pasture. We’re rolling out some spring feta this week, and we’re running a special on Moonglo. We are flush with cheese, so come on out to the market or the farm and load up! Fresh chevre: plain, herbs de Provence, cracked pepper—the lemony flavor of our summer chevre is a perfect foil for a mixed green salad or a simple frittata made with local mushrooms. You can taste the pasture in our milk right now! Goat Milk Feta: the first of the season feta is HERE! We are now making our feta with pasteurized milk. It’s still aged in whey brine, imparting all the wonderful complex flavors you’ve come to expect from our feta. With summer salad season upon, the arrival of our feta is timely. Little Bloom on the Prairie: This batch is perfectly ripe. Serve with local honey or one of the jams in our farm store. If you want to go the savory route, try serving a round with one of our new spring pestos—wild ramp or green garlic or fermented green garlic in brine (found only in our farm store). Angel Food: our little “mini-brie” or crottin style bloomy rind; this new batch of Angel Food is young, firm and tangy. For those you who like it slightly tart and crumbly, this is your cheese this week. Try crumbling over roasted beets. Black Goat: an ash-coated bloomy with a delicate and crinkly yeasty rind. This batch is young, but it has a sublime fudgy consistency and a hint of yeastiness on the rind. 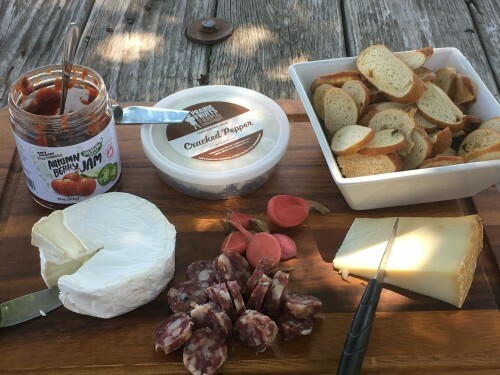 Try pairing with spicy dry-cured salami. Moonglo: fall-milk, tomme-style cheese; the texture of this semi-hard cheese is soft and supple like Gouda, but the taste is sharp and fruity. Ask for a taste if you’ve never had it before. Try it on crusty bread with onion jam or caramelized onions. Try melting it for a gourmet grilled cheese. This week, we have a batch with soft rinds, so we’re running a special--$5/lb. off the regular price. Ask for a taste—all you have to do is cut off the rind, and enjoy the delicious cheese within. Huckleberry Blue: our limited late fall goats’ milk blue cheese—it’s a gateway to blue cheeses; creamy texture, not overly blue-veined (or sharp in a blue way). This cheese is great crumbled on a salad, sliced and warmed on a steak or burger OR served on baguette with a fig jam or walnut balsamic vinegar reduction (this is an amazing combination). This cheese is ONLY available directly from us—no wholesale buyers have this cheese right now. DON’T FORGET: we have a new spot at the farmers’ market--Urbana Market at the Square. We are in spot #20 on the south-west (along Illinois Street) end of the market. We are right next to Moore Family Farm. The farm’s summer hours have begun; now through the end of August, we will be open Wednesdays-Fridays, 3-7 pm, as well as Saturdays and Sundays, 1-4 pm. The farm is a tranquil green space where you can come after work to unwind. During our open hours, you can “build your own” cheese boards—pick out your cheeses, add a salami (Underground Meats) or jar of jam or pesto, grab some bagel chips (Lucky Pierre Bakers) and we’ll provide the board. You can sit outside under our new pavilion roof and enjoy a glass of wine or beer with cheese! If you just want to come out to do a little shopping in farm store, we’ll have cheese and scoops of gelato as well as other farmer products: locally milled whole wheat flour from The Mill at Janie’s Farm, meats, poultry eggs from Bane Family Meats, Piemonte Sausages, Jams from Autumn Berry Inspired and Prairie Fruits Farm “merch.” Check out the new products by Sarah Stewart (our former gelato maker); pickled ramps, pickled shitake mushrooms, fermented green garlic in brine and spring pestos (green garlic-pistachio and wild ramp). Dinners on the Farm: Our 2018 season has begun. 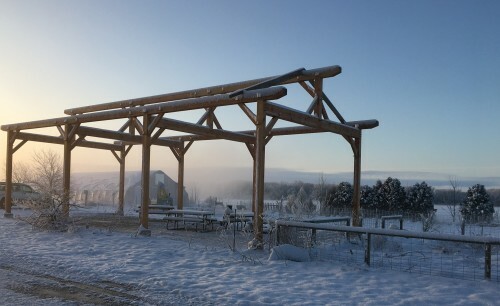 Summer is a great time to enjoy dining outside at the farm, especially under our new timber-frame pavilion. We have some fantastic themes for summer—“Summer Tapas,” “A Crawfish Boil,” “A Cheesy Affair” (with guest from Pastoral Appellation Wine Bar) and “Summer Vegetarian” (with guest chef Dan Compton of Vie Restaurant). Do you dream of having goats in your life? Do you want a family milk goat? How about for brush control or rural pet? Goats are wonderful working animals and affectionate companions too. We have great breeding stock with excellent health and milk records. We also have retired does, bucklings and wethers for grazing/brush control and companion animal needs. Check out what's available and contact us if interested. Posted 5/31/2018 10:17pm by Leslie Cooperband or Wes Jarrell. Not being endowed with the skills to build things, I am always in awe of those in the trades. The roofers arrived bright and early on Tuesday morning this week. Within minutes, they had their equipment unloaded, and they went right to work assembling their version of a mise en place (the French culinary expression for putting all of your ingredients and tools of the trade together so you can work most efficiently). I watched their progress throughout the day; the rafters that Wes had precut were connected to the skeleton frame in lightning speed. By quitting time, the rafters and purlins were in place, ready to receive their metal covering. The crew returned early again the next day to finish the job. With the threat of thunder storms looming, their pace quickened. It was hard for me to believe they could work any faster; the barn-red metal sheets stretching across the growing roof, like an unfurling flower in a time-lapsed nature film. The intermittent bursts of rain slowed their progress. It wasn’t that they didn’t want to get wet; they educated me that wet metal is as slippery as black ice, and they didn’t want to fall. I’d say that’s legit. Despite a few setbacks, they were able to get most of the roof finished by the end of the day, returning this morning to put on the finishing touches and clean up their work space. The beautiful red roof ties in perfectly with the red doors on our barn. The pavilion is tall and grand. The shade it casts will be a welcome respite to future guests who dine under its majesty. Thank you again to those who contributed to our fundraiser to make this roof raising possible. If you’d like to see a little photo collage I put together, click here. The heat and the thunder showers are making the pasture grow lush and strong. The goats’ daily forays to the pasture and prairie are filling their udders with some delicious milk. The early summer-like conditions are producing some lovely cheeses—this week, we’ve got lemony chevre, a host of bloomy rind cheeses and fresh ricotta. Fresh chevre: plain, herbs de Provence, cracked pepper—the lemony flavor of our chevre is a perfect foil for a mixed green salad or a simple frittata made with local mushrooms. Fresh Whole-Milk Ricotta: we make our ricotta using an Italian basket style recipe. The result is a slightly more firm ricotta that has sweet-cream, delicate flavor. This ricotta is too good to put in lazagna; enjoy with simple accompaniments--either savory or sweet OR check out my recipe below for a simple, elegant seasonal dessert. Little Bloom on the Prairie: This batch is perfectly ripe. Serve with local honey or one of the jams in our farm store. If you want to go savory, try warming the round slightly and serving with one of our new spring pestos—wild ramp or green garlic (found only in our farm store). Angel Food: our little “mini-brie” or crottin style bloomy rind; we only have a few left of these very ripe & gooey little treats, so come early to the market if you want one. Moonglo: fall-milk, tomme-style cheese; the texture of this semi-hard cheese is soft and supple like Gouda, but the taste is sharp and fruity. Ask for a taste if you’ve never had it before. Try it on crusty bread with onion jam or caramelized onions. Try melting it for a gourmet grilled cheese. Gelato: We don’t have many pints of gelato for sale this week at the market, but come out to the farm to cool off with a scoop of gelato. We should be back with a full-house of gelato on June 9th. Cut off strawberry tops and cut in half, lengthwise. If big enough, scoop out part of center to make a well for the ricotta filling. Arrange strawberry halves cut side up on a serving plate. Combine fresh ricotta, cream and sugar/honey; mix to smooth consistency. Using a small tea spoon, mound the ricotta cream mixture on top of each strawberry half. Top with chopped chocolate and orange zest. Enjoy! This weekend, we are open Saturday and Sunday, 1-4 pm. Starting Wednesday, June 6th, through the end of August, we will be open Wednesdays-Fridays, 3-7 pm, as well as Saturdays and Sundays, 1-4 pm. To kick off the summer season, we’ve invited our friend Michael Darin, a local wine connoisseur, to do a little wine tasting on Thursday, June 7th, 5-7 pm. He’ll be sampling some of the wines in farm portfolio, all of which are organic and/or biodynamic. If you want to make an evening of it, we’ll be offering “build your own” cheese boards—pick out your cheeses, add a salami or jar of jam or pesto, grab some crackers and we’ll provide the board. You can sit outside under our new pavilion roof and enjoy a glass of wine with cheese! Do you dream of having goats in your life? Do you want a family milk goat? How about for brush control or rural pet? Goats are wonderful working animals and affectionate companions too. We have great breeding stock with excellent health and milk records. We have a few pregnant does and even a couple of does in milk available NOW. We also have retired does, bucklings and wethers for grazing/brush control and companion animal needs. Check out what's available and contact us if interested. Posted 5/24/2018 10:18pm by Leslie Cooperband or Wes Jarrell. There has been a slow progression of priorities from goats to plants this past week. Fewer kids demand constant attention, the does’ heads are buried in the pasture and the cheese making is falling into its full-steam summer production rhythm. It is time to turn our attention to the garden. The blankets of chickweed and creeping charley have been ripped from their soil anchors. The encroaching lemon balm, oregano and cup plant (it’s a lovely native prairie plant, but boy is it invasive!) have been whacked back into respectable spots in the herb garden, the goat-manure compost has been spread, and the soil has been tilled. My usual overly zealous winter seed purchasing was curtailed this year, so we’re going with an “essentials only” vegetable and herb garden this year. For me, the essentials include tomatoes. The requisite canning tomato varieties made the cut, as well as our beloved Juliet mini-romas (for our dried tomato chevre), green zebras and rose de bern of course and one luscious variety of cherry tomato (called sun peach-it’s sublime). Of course, we’ll put in a few varieties of peppers, some potatoes and cukes, a few varieties of basil and parsley and maybe we’ll succumb to a couple of varieties of winter squash or pole beans. Self-editing the diversity of a vegetable garden is hard. The promise of summer harvests of so many colors and flavors and textures is so alluring; the anticipated glee of biting into the first ripe tomato on the vine so convincing. I must remind myself about the time in between: the mulching, the weeding, the watering, the pest control—these memories will help me stifle the tendency to overdo the garden. This weekend, May 26-27, we are open Saturday and Sunday, 1-4 pm. You can visit with the goats, enjoy a scoop of gelato in the shade and just stroll the farm. Stay tuned for details about our extended summer hours and farm experiences. Fresh chevre: plain, herbs de Provence, cracked pepper—the lemony flavor of spring chevre is a perfect foil for slightly bitter spring leafy green vegetables—try grilling some asparagus and finish with a drizzle of really good olive oil and a few dollops of our chevre. Little Bloom on the Prairie: This batch is now perfectly ripe. Serve with local honey or one of the jams in our farm store. Try warming the round on your grill and serve with a quick pickle of ramps or beets for an even more amazing flavor explosion in your mouth. Angel Food: our little “mini-brie” or crottin style bloomy rind; If you love a gooey brie, come ‘n get ‘em. We will be running a special through our TEXT MESSAGING club this weekend on Angel Food. Text “URBANA” or “GOAT” TO 30500 to sign up and get the special offer. Gelato: We have pints of gelato available this weekend for sale at the market and at the farm store—vanilla, chocolate, espresso, fresh mint (limited),and salted caramel swirl (also limited). Posted 5/18/2018 9:01am by Leslie Cooperband or Wes Jarrell. I relish the times when we can actually walk the farm. With the frenzy of kidding season behind us, and spring settling into more summer-like behavior, we took a little stroll through the orchard this week. Many of the peach trees, planted almost 15 years ago, are starting to show their age. Some trunks look haggard, cambium cracked, leaves puny and struggling. Others show their candelabra canopies with pride, revealing tiny fruits beneath their senescent blossoms. The apple trees seem to get better with age and careful pruning; many are strong and loaded with tiny fruits. Even the pears have a respectable fruit set this year. The Moonglo pear trees’ branches tower with baby pears at their tips. Ladders will be needed to get those babies. Our Seckel pears, planted more recently to help pollinate the Moonglo pears, revealed their own bounty for the first time ever. The swell of so many tiny fruits evokes optimism. We allow our minds to jump forward to the first bites of a juicy peach, a crisp tart apple or a sublime pear. It’s too early for insect damage or fungal rot to rear their ugly heads. We can dream of the promise of perfectly ripe fruit for now. Text Message Customer Loyalty Program: Thank you to those of you who have signed up for our new text messaging program. It's great to see this program catch on. Now that spring “babies and breakfast” is behind us, we’re slowly transitioning over to summer hours. For the remaining two weekends in May, the farm will be open Saturdays and Sundays, 1-4 pm. Then, starting in June, we will add weekday hours. We are trying to create a tranquil space for folks to come to at the end of the day to enjoy the beauty of the farm, get some goat lovin’ and maybe unwind with a glass of wine or beer along with a cheese board. Stay tuned for details. In case you haven’t noticed, we have a new spot at the farmers’ market--Urbana Market at the Square. We are in spot #20 on the south-west (along Illinois Street) end of the market. We are right next to Moore Family Farm. This week, we have a great line up of cheeses and gelato for you to enjoy. Fresh chevre: plain, herbs de Provence, cracked pepper—the lemony flavor of spring chevre is a perfect foil for slightly bitter spring leafy green vegetables—try grilling some asparagus and finish with a drizzle of really good olive oil and a few dollops of our chevre. REMEMBER: TEXT "URBANA" TO 30500 TO GET THE SECRET PASSWORD FOR OUR SPECIAL FLAVOR. Little Bloom on the Prairie: This batch is now perfectly ripe. Serve with local honey or one of the jams in our farm store. Try warming the round lightly in your oven and serve with a quick pickle of ramps or beets for an even more amazing flavor explosion in your mouth. Angel Food: our little “mini-brie” or crottin style bloomy rind; If you love a gooey brie, come ‘n get ‘em. Black Goat: an ash-coated bloomy with a delicate and crinkly yeasty rind. The rounds are perfectly ripe with even more gooeyness on the edges. I love this cheese with spicy dry-cured salami. Goat milk yogurt from Green Meadows Farm: This locally-made plain goat milk yogurt, is available inquart size only. This is a special batch that contains only goat milk and live cultures (no added thickeners); very limited quantities. Dinners on the Farm: Our 2018 season is filling up. We now have the menus posted for the first spring dinner and our “Jar Sessions” dinner. Take a look at the season and book your reservations NOW. Can we tempt you with the menu for our first spring dinner featuring Caveny Farm Lamb? Looking for a goat for a family milker? How about for brush control or rural pet? Goats are wonderful working animals and affectionate companions too. We have great breeding stock with excellent health and milk records. We also have bucklings and wethers for grazing/brush control and companion animal needs. Check out what's available and contact us if interested. Posted 5/11/2018 11:22am by Leslie Cooperband or Wes Jarrell. Hot off the grill, slender or fat, purple or green; biting into the first asparagus of the season is sublime. Like so many seasonal foods, picked at their peak, there is no resemblance to the supermarket facsimiles who mimic them in appearance only. Freshly picked, even better when you pick them yourself, brushed with a little olive oil and salt, softened on a hot grill for a matter of minutes—the secrets to maximum enjoyment are minimalist. There is something slightly strange about this stalky perennial vegetable that pokes it heads out of the ground each spring. It’s a textural and gustatory delight; the crunch, crunch, crunch upon entry into your mouth; the slightly sweet and slightly bitter flavors that explode on the palate as the stalk contents are revealed. Right now, I can’t get enough. Soon, my asparagus gorging will turn to satiation. The lush pastures and the daily goat forays to the prairie are making their marks on the milk in the cheese vat. Already, we can see changes to the texture of the chevre and how the curd cuts for our Moonglo makes. Each spring, we anticipate these changes. We try to explain them to those new to seasonal milk; it is not something imagined, it is real. After many years of eyes on the surface of a vat of chevre or hands stirring delicate and fragile curds, we know what the goats are eating, even without witnessing their buried heads in the grass. TRY OUR NEW TEXT MESSAGING PROGRAM: In our efforts to seek out better ways to keep our patrons up to date on the latest farm happenings, special product promotions and farmers’ market offerings, we are pleased to announce a new text message program. You won’t get unwanted text messages from Prairie Fruits Farm & Creamery. You simply send a text message to 30500 with one or more of the key words below, and we only send messages to those who want to receive them. Think of this as a rewards program for our most loyal customers. We hope you’ll give it a try. This past week, we gave away a free chevre at the Urbana Market at the Square (the lucky winner is picking up her chevre this weekend). This coming week, we’ll offer a free pint of gelato (to be redeemed at the Urbana Market on Saturday, May 19th). BABIES AND BRUNCH: The final open house style brunch is tomorrow, Saturday, May 12th, 9:30-1:00. Check out the menu and come see the babies before they get too big. 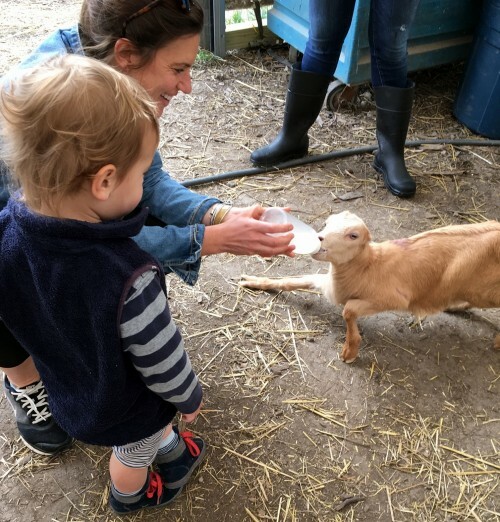 We are setting up a special baby goat petting pen on the lawn instead of having folks walk through the kid barn; it will be a more intimate setting for humans and goat babies alike. Our Sunday Mothers’ Day Brunch is sold out, but you can still get lots of great gifts for the special mothers in your lives either at the Urbana Market (Saturday May 12th, 7-12) OR at the Farm Store (Saturday May 12th, 9:30-1:00). Stay tuned for posting of our summer farm open hours. We love our new spot at the Urbana Market at the Square. If you couldn’t find us last weekend, we are in spot #20 on the south-west (along Illinois Street) end of the market. We are right next to Moore Family Farm. This week, we have a similar selection of cheese and gelato for sale at the market and in our farm store (during “Babies and Breakfast” hours—Saturday, May 12th, 9:30-1:00). Cheese is a WONDERFUL Mother’s Day Gift, so stock up on Saturday. Fresh chevre: plain, herbs de Provence, cracked pepper—the lemony flavor of spring chevre is a perfect foil for slightly bitter spring leafy green vegetables—try sautéing some fresh spinach, napini (flowering kale from Blue Moon Farm) or kale and finish with a drizzle of really good olive oil and a few dollops of our chevre. Little Bloom on the Prairie: This youngish batch is moving into deliciousness. Serve with local honey or one of the jams in our farm store. Try warming the round lightly in your oven and serve with a quick pickle of ramps or beets for an even more amazing flavor explosion in your mouth. Black Goat: an ash-coated bloomy with a delicate and crinkly yeasty rind. The rounds are perfectly ripe with a slight gooeyness on the edges. I am loving this cheese with spicy dry-cured salami. 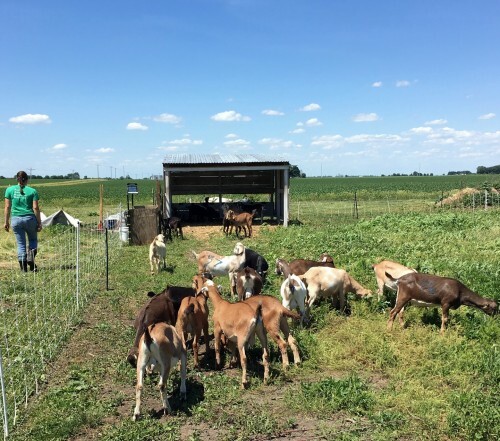 Goat milk yogurt from Green Meadows Farm: Our friend, Meryl Kauffman, in Arthur, IL raises mostly La Mancha goats (some of whom came from our herd). His goat milk products are delicious, and we're excited to carry his plain goat milk yogurt in quart size only. He has made a special batch for us that is simply goat milk and live cultures (no added thickeners). Come try some this weekend. I will bring some to market as well as have it available in our farm store. Jams and Honey: In the farm store only: We have a limited selection of jams from Autumn Berry Inspired, house-made jams and some beautiful bottles of fall honey from Two Million Blooms. These make great accompaniments to our cheeses as well as great Mother’s Day gifts. Locally-milled flour from the Mill at Janie’s Farm (Ashkum, IL)-did you know you can now get organic, locally milled, specialty grain flours? We are proud to be one of the first retail outlets for this amazing product. Make a pie or a quiche this weekend with this whole-grain flour. It’s amazing. Prairie Fruits Farm Merch: While you’re at the farm, take home a memento—t-shirts, hooded sweat shirts, batik aprons, tea towels, onesies, note cards, cheese boards and goat milk soaps from Red Barn Farm. Need a last minute Mother’s Day gift? We’ve got you covered. Dinners on the Farm: Our 2018 season is posted on our website and ticket sales are LIVE for the entire season. Take a look at the dates and themes, and book your reservations NOW. These tickets go fast, so don’t delay. The menu for our first spring dinner featuring Caveny Farm Lamb will be posted this week. Posted 5/3/2018 9:20pm by Leslie Cooperband or Wes Jarrell. The farm’s rapid transformation from hibernation to vibrant spring is akin to witnessing time lapse photography. The week’s 80 degree temps struck a match to the invisible gas that was bubbling just beneath the soil and whoosh; peach blossoms open overnight, trilling toads are singing and mating in the borrow pit pond like there’s no tomorrow, dandelions carpet the lawn in such profusion that there’s barely green between the mounds of yellow. The sidewalls have come off the Delight Flower Farm high tunnel, and the cacophony of tulips inside put the best blooming fields in Holland to shame. Our last spring birth happened with little fanfare this morning. Maxine gave birth to triplets; we barely noticed them while scooping grain to the frantic goat girls during the morning chores. It is safe to proclaim that spring is finally here! So, we begin a well-worn ritual of bringing our wares to market. May 5th, “Cinco de Mayo,” marks the start of many farmers’ markets around the state this year. For us, we return to the Urbana Farmers’ Market, the first market we attended back in 2005. Like migratory birds returning to the place of their birth to further the next generation, we farmers return to the outdoor stalls to hawk our wares and keep the patrons satiated with the bounty of the seasons. The idea of the farmers’ market is grounded in ancient traditions; farmers come to the cities from the countryside, hoping to convince the non-self-sufficient city dwellers to buy their products. Modern farmers aren’t that different than their ancestors. We strive to produce the highest quality products, and we compete with fellow farmers to display them in eye-catching ways. We develop bonds with our customers; we learn their favorite products and offer them proudly when we see those customers approach our stand. We offer tastes and descriptions, we tell stories from the farm; we strive to connect their food with the land. Yet, in recent times, the modern farmer has had to expand his/her skill sets beyond the traditional roles of producing and bringing to market. Most successful farmers have moved beyond just knowing how to grow crops, raise livestock, or, in our case, transforming milk into cheese. We immerse ourselves in the latest digital tips for catching the attention of our customers: we use Facebook, Twitter and Instagram as proxies for our beautiful market displays. We try to connect our customers to our farms with instant and every changing images of daily farm life. We move between the old traditions and the modern digital imperatives. We weave these seemingly discordant threads together in the hopes of convincing our market patrons that the connection between farmer and consumer is unique and still worthwhile. In our efforts to seek out better ways to keep our patrons up to date on the latest farm happenings, special product promotions and farmers’ market offerings, we are pleased to announce a new text message program. You won’t get unwanted text messages from Prairie Fruits Farm & Creamery. You simply send a text message to 30500 with one or more of the key words below, and we only send messages to those who want to receive them. Think of this as a rewards program for our most loyal customers. In celebration of spring and the first farmers’ market of the season, we are running a special promotion for farm fans who sign up for text messaging program. Either text URBANA to 30500 or GOAT to 30500, and a lucky winner will get a free container of chevre to be claimed at the following Saturday (May 12th) Urbana Market at the Square. FUNDRAISER A HUGE SUCCESS! Our “Raise the Roof” fundraiser campaign has ended, and we are so grateful to all of you who donated. We raised a little over $25,000! We will definitely be able to put the roof on our pavilion and tackle one or two of the other projects on our wish list. Over the next few weeks, we will be contacting those of you who donated at the different levels with details about your “thank you gifts.” Again, the community support was tremendous and we thank all of you! BABIES AND BRUNCH: Full Brunch on BOTH Saturdays and Sundays is HERE FOR ONLY TWO MORE WEEKENDS! Come out to the farm this weekend, May 5th and 6th—we’re open from 9:30 am to 1:00 pm both days. Check out this weekend’s NEW menu that Chef Raquel and Sarah of Feast Catering have crafted as well as the details of how these brunches are run. Here’s how the farm “Pop-Up Café” works: we seat you at a table, you order your food and you enjoy a more substantial brunch. If you have to wait for a table (so far, people have only had to wait 5-10 minutes), you can visit with the goats, sample our cheese and gelato and/or shop in our farm store. Many of our long-time customers LOVE the new system. NO MORE LONG LINES!! Cheese and Gelato Offerings We are back at the farmers’ market this Saturday, May 5th, and we’ll also have a limited selection of cheese and gelato for sale in the farm store during “Babies and Breakfast.” We have a full house of bloomy rind cheeses to offer you this weekend—angel food, little bloom and black goat are in the line- up as well as our creamy & tangy chevre. Little Bloom on the Prairie: We have some nice gooey ripe rounds as well as young rounds this week. Serve with local honey or one of the jams in our farm store. Try warming the round lightly in your oven and serve with a quick pickle of ramps or beets for an even more amazing flavor explosion in your mouth. Black Goat: an ash-coated bloomy with a delicate and crinkly yeasty rind. The rounds are unctuous and fudgy. Jams and Honey: In the farm store only: We have a limited selection of jams from Autumn Berry Inspired, house-made jams and some beautiful bottles of fall honey from Two Million Blooms. These make great accompaniments to our cheeses. Other Farm Products at the Farm Store Goat milk yogurt from Green Meadows Farm Our friend, Meryl Kauffman, in Arthur, IL raises mostly La Mancha goats (some of whom came from our herd). His goat milk products are delicious, and we're excited to carry his plain goat milk yogurt in quart size only. He has made a special batch for us that is JUST goat milk and live cultures (no added thickeners). Come try some this weekend. I will bring some to market as well as have it available in our farm store. Bane Family Meats has farm-fresh eggs, chicken, beef, pork and lamb products. Locally milled flour from the Mill at Janie’s Farm (Ashkum, IL)-did you know you can now get organic, locally milled, specialty grain flours? We are proud to be one of the first retail outlets for this amazing product. Make a pie or a quiche this weekend with this whole-grain flour. It’s amazing. Prairie Fruits Farm Merch: While you’re here, take home a memento from the farm—t-shirts, hooded sweat shirts, batik aprons, tea towels, onesies, note cards, cheese boards and goat milk soaps. Cheese and Gelato CSA: The deadline for sign up is SATURDAY May 5th, so if you’ve been on the fence, act now. If you’re not familiar with how our “CSA” works, I encourage you to check out the details. We have pick up locations in Champaign Urbana and Bloomington-Normal. We treat our CSA members like royalty. Come join our special club. Dinners on the Farm: Our 2018 season is posted on our website and ticket sales are LIVE for the entire season. Take a look at the dates and themes, and book your reservations NOW. These tickets go fast, so don’t delay. We’re excited to host you on our farm for a memorable farm to table experience. Posted 4/27/2018 11:18am by Leslie Cooperband or Wes Jarrell. This year’s kidding season has been challenging on a number of fronts. We had our usual share of breach and twisted kids needing delivery assistance, but the one that completely through us for a loop was a little doeling born to Malta. Malta is a large-bodied La Mancha doe who we purchased from a goat dairy in Iowa last fall. During one of those peak baby-boom Sundays in early March, I assisted in the delivery of her twins. They were lovely caramel-colored kids, a buckling and a doeling. The doeling had one front leg tucked backwards, but the delivery was not difficult and all seemed well. It was only after a couple of days, when we moved the kids from the birthing totes to the “newborn” pen, that we realized that the doeling couldn’t stand or walk. We’d seen this many times before—sometimes kids born with twisted limbs have weak leg muscles that delay them standing and walking. No problem, we thought; we just splint the legs to help muscles develop, and within a week, the issue resolves itself. This trick didn’t work at all. In fact, she would just fall flat on her face and struggle to right herself. We noticed she had an unusual knot in her neck and her head was tilted to one side. The reality that something was fundamentally wrong with her anatomy began to sink in. Since her delivery was mostly normal, we were skeptical that she had sustained an injury during birth. Despite her awkward posture, she had a voracious appetite and would down a bottle of milk in minutes. During feeding times, her eyes would lock fiercely onto yours, and her tail would wag with a fervor suggesting a strong will to live. We tried massaging her legs and giving her support to force her to stand. She was fostered by a small army of volunteers and staff over the ensuing weeks, each person taking her home for a weekend here and there to give her a little extra TLC, ever hopeful that we could get her to stand. 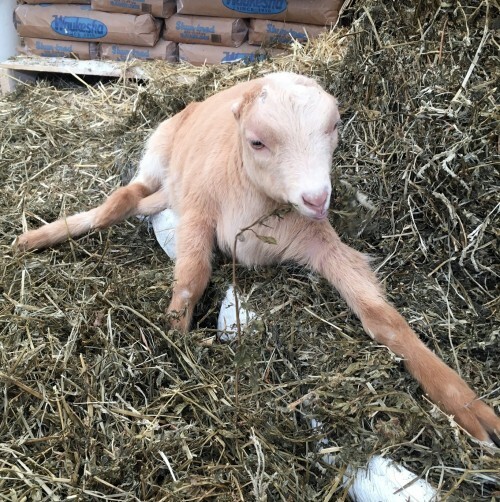 One of our newest staff members, Zev, developed a particularly strong bond with her, determined to work with her and find her a home that could better accommodate a special needs goat. On his own time, he took her to the vet school to get an X-ray of her spine. Amazingly, the X-ray showed a rare spinal cord deformity in her neck; one of her vertebrae was oriented backwards, causing the bulge that we could see and feel and likely preventing her brain from coordinating movement to her limbs. The experts’ prognosis was that she would probably never be able to walk. She had other plans in mind. 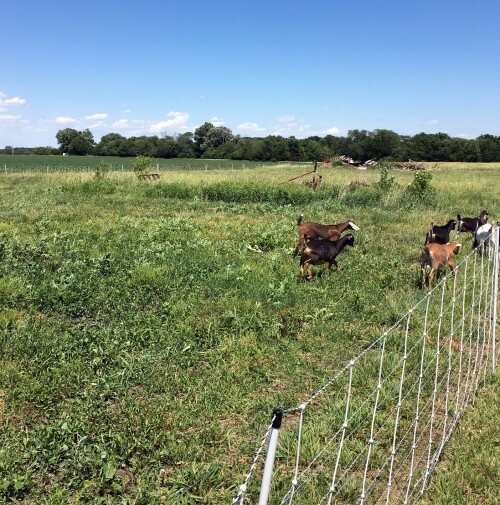 The growing fans and foster parents of the “Malta-baby” named her “pigweed,” an apt name for a pugnacious little goat whose resilience surprised and impressed us all. After nearly two months of patience and gentle encouragement, she started to stand with assistance. Just last week, she took a few steps on her own. Now she is “running,” especially when a bottle of milk is held in front of her. Her gait is faulting and awkwardly endearing, but she has warmed all of our hearts with her determination and grit. 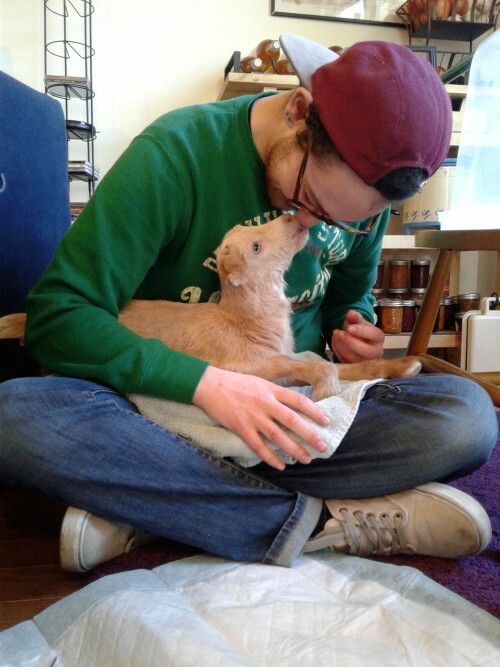 We have all become way too attached to this little goat that couldn’t. She is leaving the farm this weekend to go to her new home in Pennsylvania—a goat rescue/rehab center that specializes in special needs goats. While we know she is going to a place that can take better care of her, her departure is bittersweet. She has brought us joy during trying times this spring. “Au revoir” little pigweed. Monday, April 30th, is the final date for our fundraising campaign. So many of you have given so generously, and we are so grateful. We are really close to having raised $20,000. We are also really close to attaining the match for our special donor’s offer of donating $2500. If you aren’t yet familiar with our “Raise the Roof” campaign, please CLICK HERE, you can read all about it—our projects, our goals, our donation levels. You can either donate online or send a check. We will also have a donation box out at the farm during spring open hours if you’d prefer to donate that way. THANK YOU so much to all who have donated so far. In our efforts to seek out better ways to keep our patrons up to date on the latest farm happenings, special product promotions and farmers’ market offerings, we are pleased to announce a new text message program. You won’t get unwanted text messages from Prairie Fruits Farm & Creamery. You simply send a text message to 30500 with one or more of the key words below, and we only send messages to those who want to receive them. We hope to use text messaging to reward our most loyal customers. Think of this as a rewards program for our most loyal customers. We hope you’ll give it a try. It’s an easy way to stay in touch with the farm and all of our goings-on. It’s a great way to get the best deals on our products. 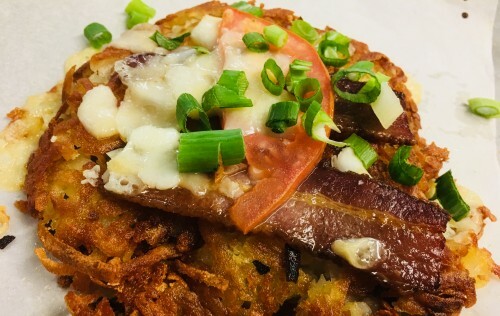 Full Brunch on BOTH Saturdays and Sundays is HAPPENING! Come out to the farm this weekend—we’re open from 9:30 am to 1:00 pm. Saturday is the IL Marathon, but you should be able to get out to the farm once the runners pass your area. Here’s a link t to the Illinois Marathon route, so you can see how your roads might be impacted. For those of you running, come out after the race to refuel with some great eats. Check out this weekend’s NEW menu that Chef Raquel and Sarah of Feast Catering have crafted as well as the details of how these brunches will be run. Here’s how the farm “Pop-Up Café” works: we seat you at a table, you order your food and you enjoy a more substantial brunch. If you have to wait for a table (so far, people have only had to wait 5-10 minutes), you can visit with the goats, sample our cheese and gelato and/or shop in our farm store. We have a full house of bloomy rind cheeses to offer you this weekend—angel food, little bloom and black goat are back in the line- up as well as our creamy & tangy chevre. Fresh chevre: plain, herbs de Provence, cracked pepper—the lemony flavor of spring chevre is a perfect foil for slightly bitter spring leafy green vegetables—try sautéing some fresh spinach or kale and finish with a drizzle of really good olive oil and a few dollops of our chevre. Need to be convinced that our chevre has made a mark on the national cheese stage? Check out this article in Cheese Connoisseur Magazine. Little Bloom on the Prairie: first of the season goat milk-camembert style cheese is ready for prime time. The little rounds blanketed in a delicate, white mushroomy rind are young, but the flavor is creamy sweet spring milk. Serve with local honey or one of the jams in our farm store. Try warming the round lightly in your oven for an even more amazing flavor explosion in your mouth. Moonglo: fall-milk, tomme-style cheese; the texture of this semi-hard cheese is soft and supple like Gouda, but the taste is sharp and fruity. Ask for a taste if you’ve never had it before. Try it on crusty bread with onion jam or caramelized onions. Jams and Honey: We have a limited selection of jams from Autumn Berry Inspired, house-made jams and some beautiful bottles of fall honey from Two Million Blooms. These make great accompaniments to our cheeses. Gelato: We have pints of gelato available this weekend—vanilla, chocolate and salted caramel swirl, as well as scoops of vanilla, red currant and rhubarb swirl. Other Farm Products NEW in the Store: Goat milk yogurt from Green Meadows Farm. Our friend, Meryl Kauffman, in Arthur, IL raises mostly La Mancha goats (some of whom came from our herd). His goat milk products are delicious, and we're excited to carry his plain goat milk yogurt in quart size only. He has made a special batch for us that is JUST goat milk and live cultures (no added thickeners). Come try some this weekend. Mother’s Day Brunch: Our second seating (11:30-1:30) is sold out, but we still have plenty of seats open for the first seating (9:00-11:00) on Sunday, May 13th, Mother’s Day. This is a brunch buffet by reservation only. Check out the menu for this special mother’s day brunch and book your tickets now! Cheese and Gelato CSA: We still have openings for our 2018 season. The deadline for sign up is May 5th, so if you’ve been on the fence, act soon. If you’re not familiar with how our “CSA” works, I encourage you to check out the details. We have pick up locations in Champaign Urbana and Bloomington-Normal. We treat our CSA members like royalty. Come join our special club. We will be attending an information meeting about CSA's in Champaign this Saturday, April 28th, 3:30-4:30 at the Champaign Public Library. Blue Moon Farm, Bane Family Meats and other CSA farms will be there too. Special Cheese Dinner at Eataly—we’re teaming up the cheese and culinary folks at Eataly-Chicago to offer a very special, slow-food dinner featuring our cheese on Thursday, May 24th. The event will be part class-part meal. Check out the details and make your reservations now. Looking for a goat for a family milker? How about for brush control or rural pet? Goats are wonderful working animals and affectionate companions too. We have great breeding stock with excellent health and milk records. We also have bucklings and wethers for grazing/brush control and companion animal needs. Check out what's available and contact us if interested. Posted 4/19/2018 9:31pm by Leslie Cooperband or Wes Jarrell. Earth Day is a somewhat random date on the calendar. April historically is a fitting month to celebrate the earth in the northern hemisphere. After all, it is a time of environmental reawakening, the re-greening of a seasonally dormant and dull landscape. It serves as a punctuation mark, a call to attention, mostly for those who don’t perceive that their lives or livelihoods depend on the natural world. 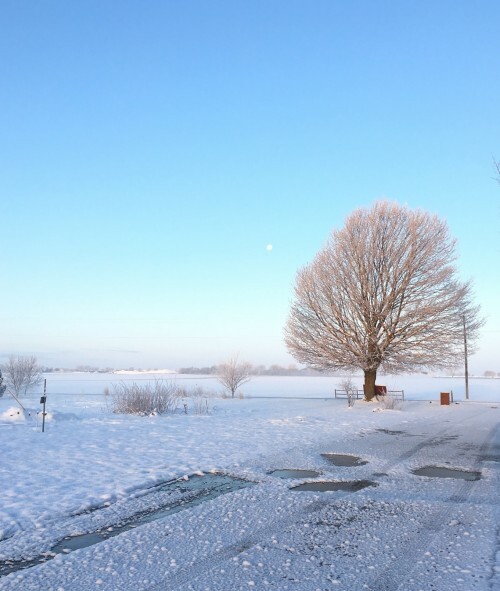 We farmers are reminded daily of our inter-dependence on the whims of nature and her fragility; her cruel snow squalls in April, her marvelous swelling of peach blossom buds. This year’s exceedingly slow departure of winter and reluctant arrival of spring have given us pause for special reflection. Farming is a progression of tasks that assume the change of seasons. In spring, we assume the sun will shine and the days will get warmer, we assume the pasture will grow so the goats can go out and graze, we assume the soil will be warm and dry enough to till and plant early season vegetables. When these assumptions are stymied, we raise our fists in frustration, we obsess about the daily temperature highs and lows and the incessant waves of storms, we curse the mud and the tractor ruts, and we resent the continued need for multiple layers of clothing. We lament the changes to our planet that invalidate the normal assumptions we have made for so many years. We want to believe we are stewards of the land, that we take care of her, and she provides for us in return. We think we are fulfilling our end of the bargain, but the rules of engagement are shifting. Earth Day is a reminder to put ourselves in a bigger context; to make connections beyond our daily spheres of influence. We need to up our game of stewardship. We are fast approaching the end date of our fundraiser campaign-April 30th, and we’re making great progress (close to $14K at this point). A very generous donor has offered to donate $2500 if we can match this amount with collective donations by April 30th. So, here’s the challenge: please donate NOW so we can take advantage of this most generous offer. If you aren’t yet familiar with our “Raise the Roof” campaign, please CLICK HERE, you can read all about it—our projects, our goals, our donation levels. You can either donate online or send a check. We will also have a donation box out at the farm during spring open hours if you’d prefer to donate that way. THANK YOU to all who have donated so far. In our efforts to seek out better ways to keep our patrons up to date on the latest farm happenings, special product promotions and farmers’ market offerings, we are pleased to announce a new text message program. You won’t get unwanted text messages from Prairie Fruits Farm & Creamery. You send a text message to the number 30500 with the key words below, and we only send messages to those who want to receive them. We hope you’ll give it a try. It’s an easy way to stay in touch with the farm and all of our goings-on. Full Brunch on BOTH Saturdays and Sundays is HAPPENING! Come out to the farm this weekend—we’re open from 9:30 am to 1:00 pm. In between all the movies you’ll be watching at Ebertfest, you need to eat, right?? Check out this weekend’s NEW menu that Chef Raquel and Sarah of Feast Catering have crafted as well as the details of how these brunches will be run. The format is different than our past “Spring Open Houses,” which have featured mostly grab and go type foods and beverages. Here’s how the new farm “Pop-Up Café” works: we seat you at a table, you order your food and you enjoy a more substantial brunch. If you have to wait for a table (so far, people have only had to wait 5-10 minutes), you can visit with the goats, sample our cheese and gelato and/or shop in our farm store. We have a really great line up of cheeses to offer you this weekend, as we roll out the first bloomy rind cheese of the season—little bloom on the prairie. Also, April 21st is RAW MILK CHEESE APPRECIATION DAY. Initiated by the Oldways Cheese Coalition, this “holiday” celebrates the diversity and terroir of artisan cheeses made lovingly by hand, using old techniques that preserve and enhance the native flora of milks around the country and the world. We are pleased to offer our customers two raw (unpasteurized) milk cheeses-Moonglo and Huckleberry Blue. In fact, to celebrate Raw Milk Cheese Appreciation Day, we will be giving free tastes of both of these cheeses, and taking 10% off the price of each wedge of those two cheeses!! CELEBRATE RAW MILK CHEESE! Moonglo: fall-milk, tomme-style cheese; the texture of this semi-hard cheese is soft and supple like gouda, but the taste is sharp and fruity. Ask for a taste if you’ve never had it before. Try it on crusty bread with onion jam or caramelized onions. Gelato: We have first of the season pints of gelato available this weekend—vanilla, chocolate and salted caramel swirl, as well as scoops of salted caramel, red currant and rhubarb swirl. Goat milk yogurt from Green Meadows Farm. Our friend, Meryl Kauffman, in Arthur, IL raises mostly La Mancha goats (some of whom came from our herd). His goat milk products are delicious, and we're excited to carry his plain goat milk yogurt in quart size only. He has made a special batch for us that is JUST goat milk and live cultures (no added thickeners). Come try some this weekend. Mother’s Day Brunch: We have two seatings for brunch on May 13th, Mother’s Day. These brunches are by reservation only. Check out the menu for this special mother’s day brunch (scroll all the way down the page) and book your tickets now! The second seating is almost sold out but we still have a good number of seats for the first seating. Cheese and Gelato CSA: We still have openings for our 2018 season. The deadline for sign up is May 5th, so if you’ve been on the fence, act soon. If you’re not familiar with how our “CSA” works, I encourage you to check out the details. We have pick-up locations in Champaign Urbana and Bloomington-Normal. We treat our CSA members like royalty. Come join our special club. Dinners on the Farm: Our 2018 season is posted on our website and ticket sales are LIVE for the entire season. Take a look at the dates and themes, and book your reservations NOW. These tickets go fast, so don’t delay. We have a great diversity of dinner themes this year from Italian to Oaxacan. We’re excited to host you on our farm for a memorable farm to table experience. Posted 4/12/2018 7:19pm by Leslie Cooperband or Wes Jarrell. One of our two-year old first-fresheners (freshening refers to giving birth and coming into milk) kidded this past weekend, just before our “Babies & Brunch.” Couscous, the great-grand-daughter of our foundation doe, Chippewa (the namesake for our farm logo-mascot “Chippy”), gave birth to twin does. One of these little does may well continue the legacy of high butterfat milk, longevity and matronly manner on our farm. When your memory is stretched to push back into the great or great-great grandmother lineages, you know you’ve been in the goat business a long time. We have several genetic lines like this one. They harken back to the early days when we had no idea what we were doing with breeding. We did our research, tried to buy foundation stock from reputable breeders who we thought understood our goals, put unrelated purebred bucks in with random groups of does, and hoped for the best. Over the years, our herd has developed a unique genetic fingerprint, a blending of the best of the two main breeds in our herd-Nubian & La Mancha. When people come to our farm to buy their own “starter” herds, they often ask for purebreds only. Most fall for the floppy-eared puppy-doglike Nubians. I try to convince them that the gems in our herd are the hybrids; the serendipitous blends with the awkward dangly elf ears that give us the most delicious milk and worm their way into our hearts. The donations keep rolling in. Our campaign will be ending at the end of April, so if you’ve been thinking about donating (small or large, all are much appreciated), don’t delay. If you aren’t yet familiar with our “Raise the Roof” campaign, please CLICK HERE, you can read all about it—our projects, our goals, our donation levels. As we’ve stated before, this community has been very good to us over the years. You can either donate online or send a check. We will also have a donation box out at the farm during spring open hours if you’d prefer to donate that way. Babies and Brunch: Full Brunch on BOTH Saturdays and Sundays is FINALLY here! Come out to the farm this weekend—we’re open from 9:30 am to 1:00 pm. Check out the NEW fabulous menu that Chef Raquel and Sarah of Feast Catering have crafted for this week as well as the details of how these brunches will be run. The format is different than our “Spring Open Houses,” which have featured mostly grab and go type foods and beverages. We’re calling it a “Pop-Up Café,” where you can sit at tables, order your food and enjoy a more substantial meal. Fresh chevre special flavors: cinnamon sugar, caramelized onion—these are limited edition flavors, so get them while they last! Goat milk Feta in Olive Oil: a late fall batch of raw-milk feta bathed in extra virgin olive oil and select dried herbs—perfect for early spring salads or on top of a hearty stew. Very limited availability. Gelato: We just have gelato by the scoop this weekend—salted caramel swirl, tart-cherry stracciatella and coffee. Gelato by the pint should be available next week. NEW in the Farm Store: Green Meadows Farm Goat Milk Yogurt. Our friend, Meryl Kauffman, in Arthur, IL raises mostly La Mancha goats (some of whom came from our herd). His goat milk products are delicious, and we're excited to carry his plain goat milk yogurt in quart size only. He has made a special batch for us that is JUST goat milk and live cultures (no added thickeners). Come try some this weekend. Other Farm Products: David Bane of Bane Family Meats will be here to offer you farm-fresh eggs, chicken, beef, pork and lamb products We also have a selection of Piemonte Sausages: several styles of pork sausage, a new chicken-basil-tomato sausage as well as our goat merguez. Mother’s Day Brunch: We have two seatings for brunch on May 13th, Mother’s Day. These brunches are by reservation only. Check out the menu for this special mother’s day brunch and book your tickets now! They’re going fast. Cheese and Gelato CSA: We still have openings for our 2018 season. If you’re not familiar with how our “CSA” works, I encourage you to check out the details. We have pick up locations in Champaign Urbana and Bloomington-Normal. We treat our CSA members like royalty. Come join our special club. Looking for a goat for a family milker? How about for brush control or rural pet? Goats are wonderful working animals and affectionate companions too. We have great breeding stock with excellent health and milk records. Check out what's available and contact us if interested. Posted 4/6/2018 9:22am by Leslie Cooperband or Wes Jarrell. Crystalline white petals encasing a bright orange trumpet; the daffodil is the persistent harbinger of spring. On Sunday, April 1st, we awoke to a blanket of over four inches of pristine white snow; the warm soil beneath gasping for breath. The waning moon was still in the western sky, while the warming sun rose over the creek to the east. There was steam rising over the borrow pit pond and snowy ice crystals coating the emergent green stems of weeds in the pasture. Daffodils frozen tall in a bed of snow; a cruel April Fools prank, indeed. Assuming that this spring would be like most others here in the Midwest, we had moved our bucks out to the pasture just before kidding season commenced. The poor guys have had to endure several snow squalls and a blizzard-more snow than we got in the months of January and February combined. I’m impressed with their adaptability. They have toughened up quite a bit (yes, they have shelter to get out of the weather), and the April Fool’s Day snow didn’t slow them down one bit. As I pushed out the fluffy white stuff out of their feed troughs, they wait, with steaming breath, for the promise of grain and fresh hay. We’re all trying to come to grips with discordant weather, and we all must eat. Fundraiser Campaign Update: The donations continue to flow in and we continue to be so grateful. We are now over $11,000, close to one third of our total goal. If you aren’t yet familiar with our “Raise the Roof” campaign, please CLICK HERE, you can read all about it—our projects, our goals, our donation levels. As we’ve stated before, this community has been very good to us over the years. We hope you’ll consider making a donation (small or large) to help us “Raise the Roof” and take the farm to whole new level. We will also have a donation box out at the farm during spring open hours if you’d prefer to donate that way. Gelato: We have limited pint flavors (chocolate, fruitti di bosco and nectarine sorbetto) and gelato by the scoop (pistachio, salted caramel and coffee for sure). Special Graduation Dinner & Mother’s Day Brunch: We are offering a special farm to table dinner for graduates and their families on Saturday May 12th AND a local-foods brunch buffet for Mother’s Day. Check out the menu for dinner and/or mother’s day brunch and book your tickets now! They’re going fast. Dinners on the Farm: Our 2018 season is now posted on our website and ticket sales are LIVE for the entire season. Take a look at the dates and themes, and book your reservations NOW. These tickets go fast, so don’t delay. We have a great diversity of dinner themes this year from Italian to Oaxacan. We’re excited to host you on our farm for a memorable farm to table experience. Looking for a goat for a family milker? How about for brush control or rural pet? Goats are wonderful working animals and affectionate companions too. We have a few retired milkers and great breeding stock with excellent health and milk records. Check out what's available and contact us if interested.